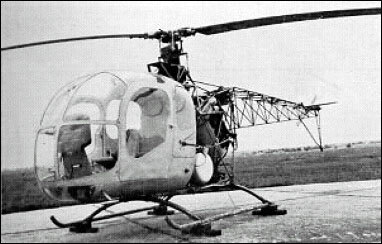 Three-seat helicopter with enclosed cabin, open-frame rear fuselage, skid u/c, GRP main rotor and one 180hp Narkiewicz WN-6S piston engine mounted at an angle behind cabin section. Prot. FF 1962. The WSK-Swidnik SM-4 Latka is a Polish three-seater light helicopter. The SM-4 Latka is powered by a Narkiewicz WN-6S six-cylinder horizontally-opposed air-cooled engine providing a cruising speed of 115km/h and a range of 300km. A fuselage was made in big part of plastic. The only prototype of SM-4 Łątka (Latka) was built in 1962 and ground-tested, but was not flown, because its prototype engine 180 hp WN-6S was not fully tested and not approved for flight. A fuselage was made in big part of plastic.